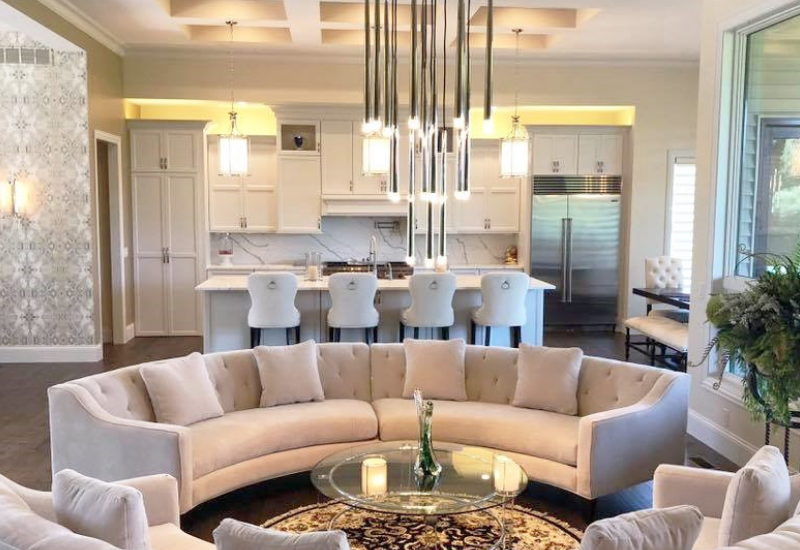 The Quad Cities Builders and Remodelers Association Fall Parade of Homes is coming up Mid-October and we wanted to give you a tour of one of the homes you can expect to see there. 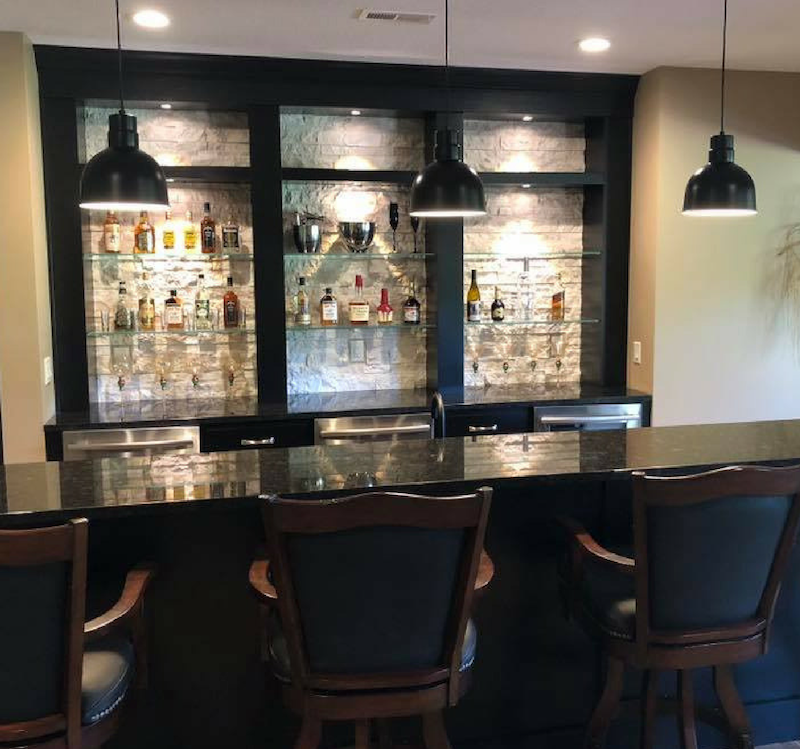 This home is built and designed by Aspen Homes LLC in Bettendorf, Iowa. 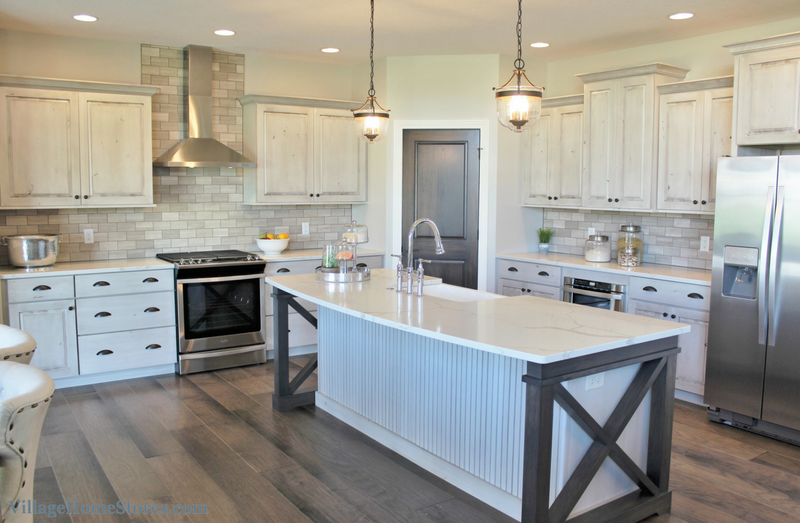 A polished farmhouse style filled with new finishes and timeless but trendy looks. The new “White Drift” painted finish from our Koch Classic line has been applied to a Rustic Birch wood in the “Hastings” door. 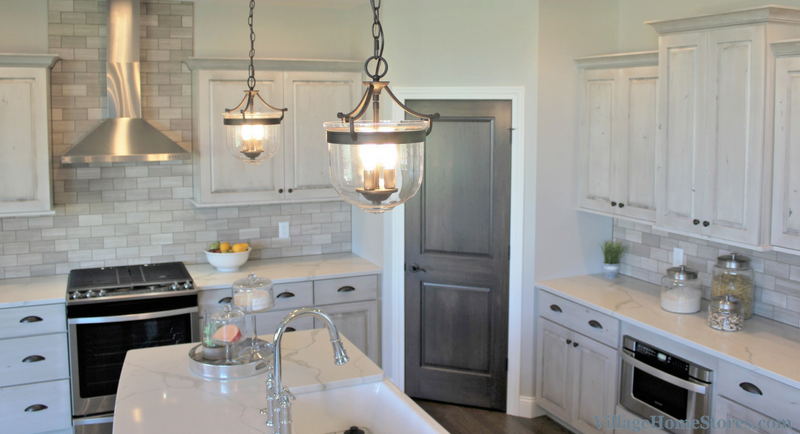 This antiqued look finish makes up the main kitchen and island cabinetry. A custom interior pantry door and “X” endcaps for the island are in a Hickory wood and “stone” stain. 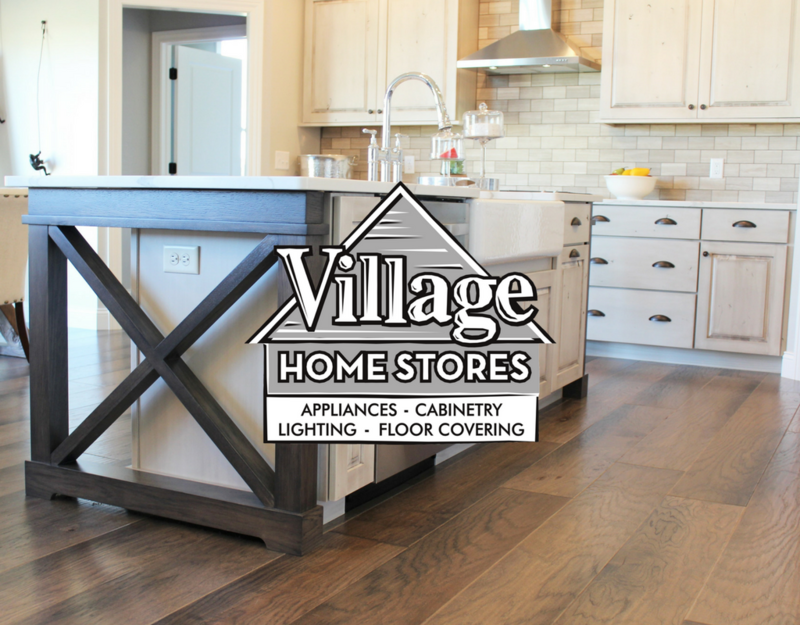 Did you know Village Home Stores can order you interior doors perfect for your design? We can! 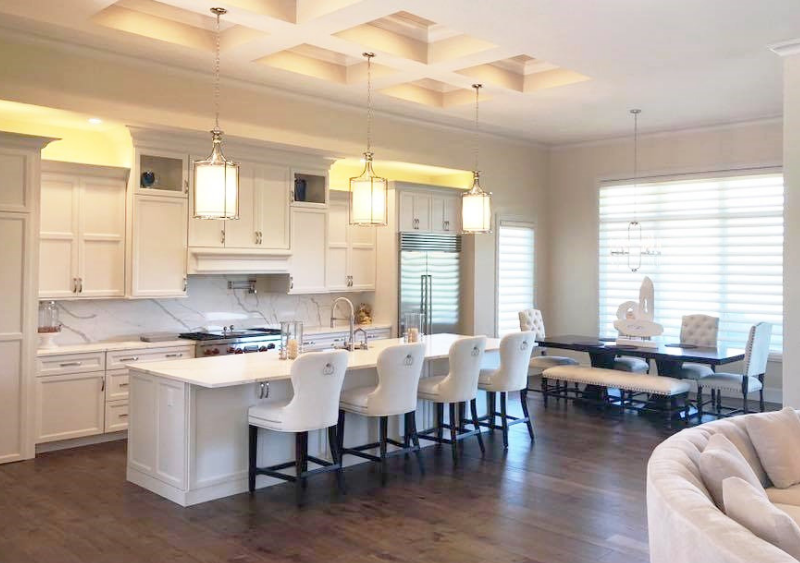 Two “Covington” lantern pendants from our Capital Lighting line hang above the kitchen island. These same lights would look great in a foyer or many other applications. 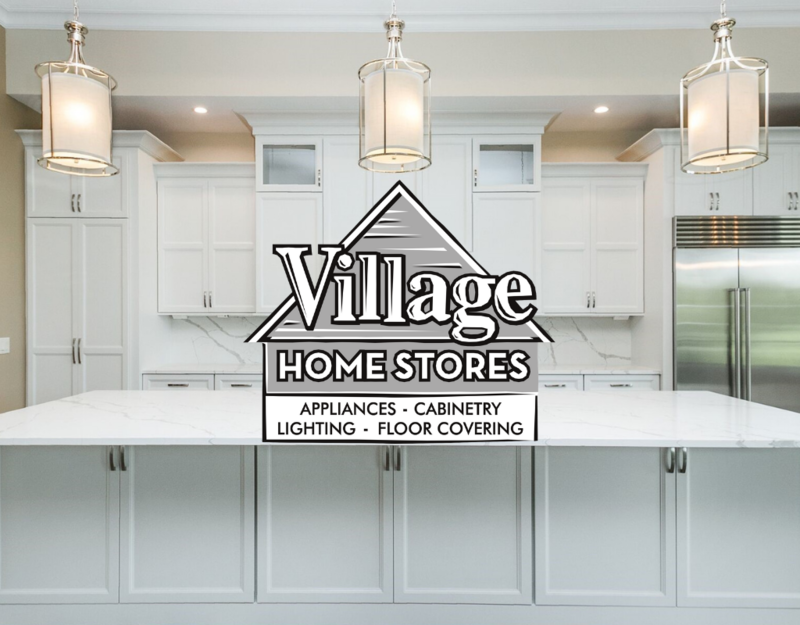 Your lighting expert at Village will help you select the right fixtures in style and scale for your space. 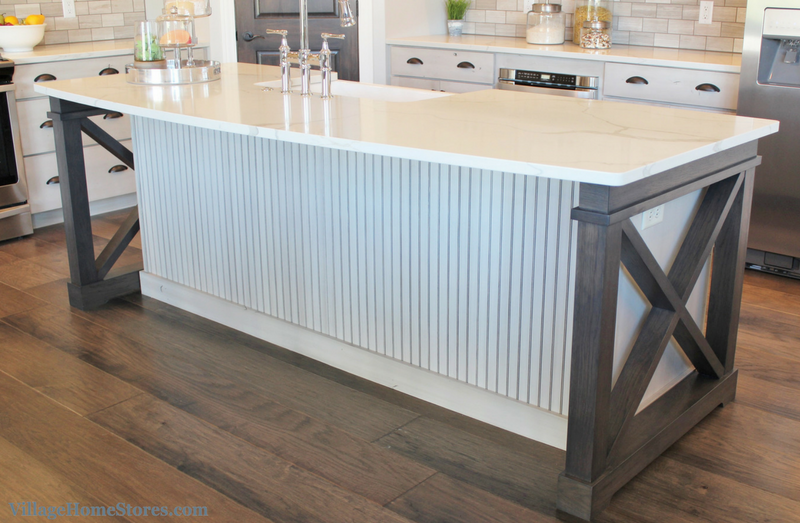 This kitchen blends many metal finishes and it works well in the completed Great Room space. The “Hastings” cabinet door by Koch is a Full-Overlay style. 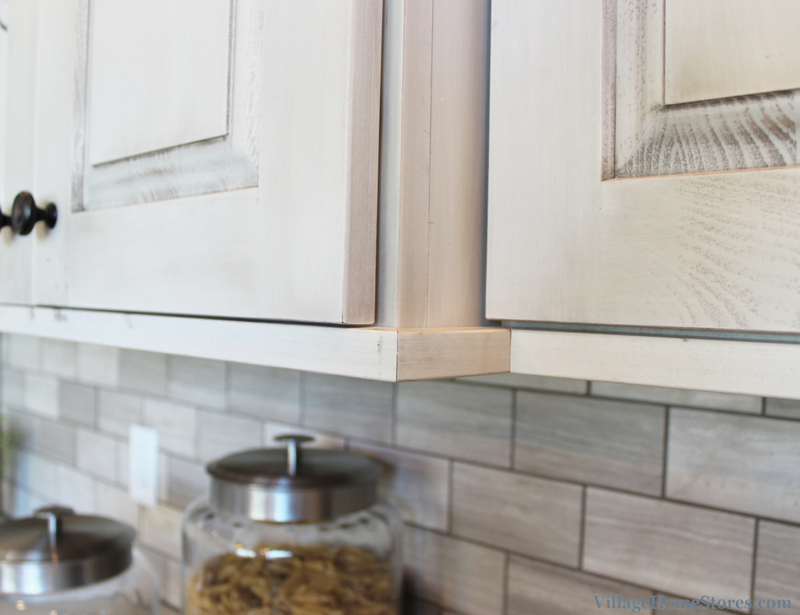 This means that there is minimal gaps between the cabinet door edges and the faceframe of the cabinet. It is a great look and when finished off with an undercabinet molding, the look is very polished and complete. Each end of the kitchen island has been fit with custom “X” endcaps. These endcaps where completely custom made by our Amish line to match the Hickory “Stone” stain repeated in the pantry door. 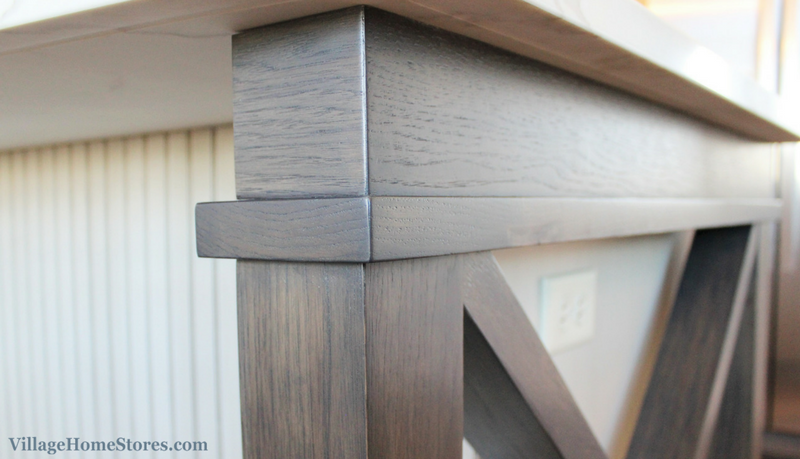 The look of this finish allows the woodgrain to glow through. 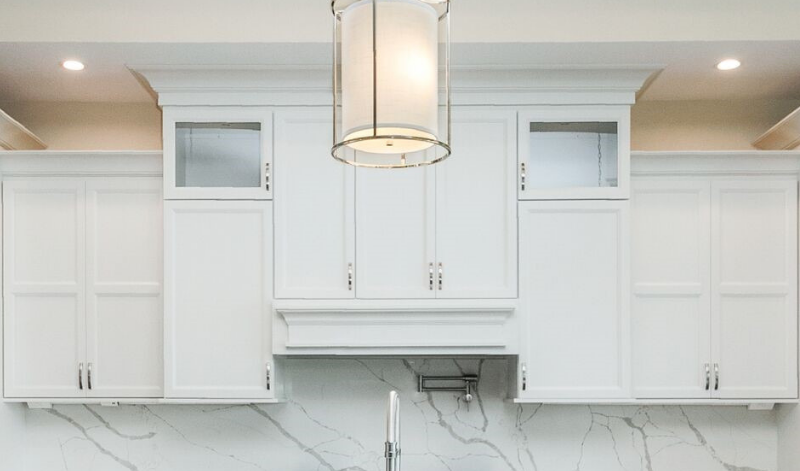 The balance of the pantry door and island endcaps is the perfect subtle accent amount. 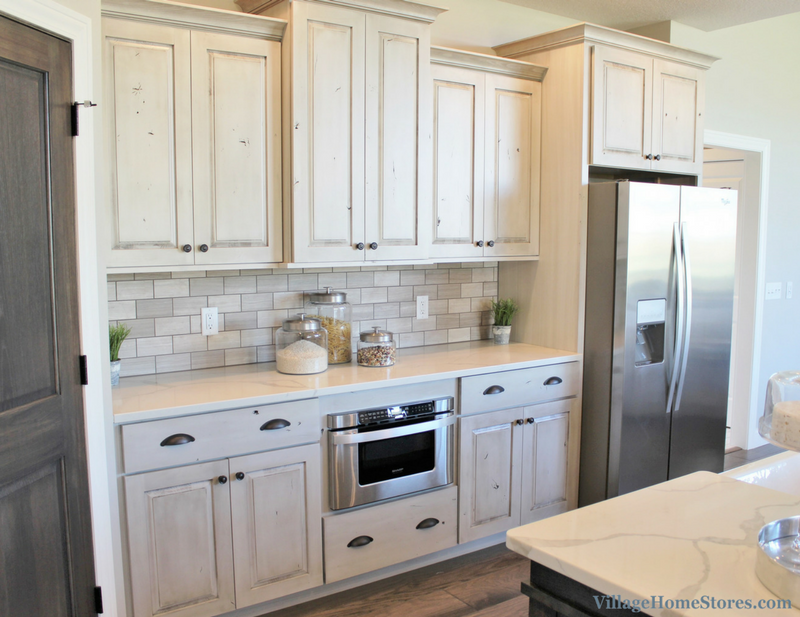 The gray stain is complimentary to the accent highlights in the main cabinetry finish. 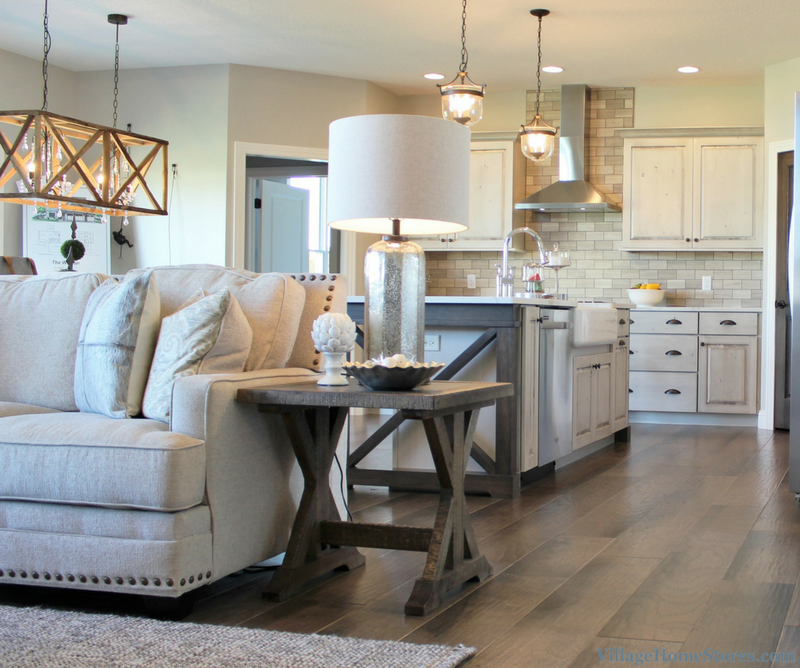 By selecting a gray stain, that allows a customer to really go many directions for a wood flooring selection. 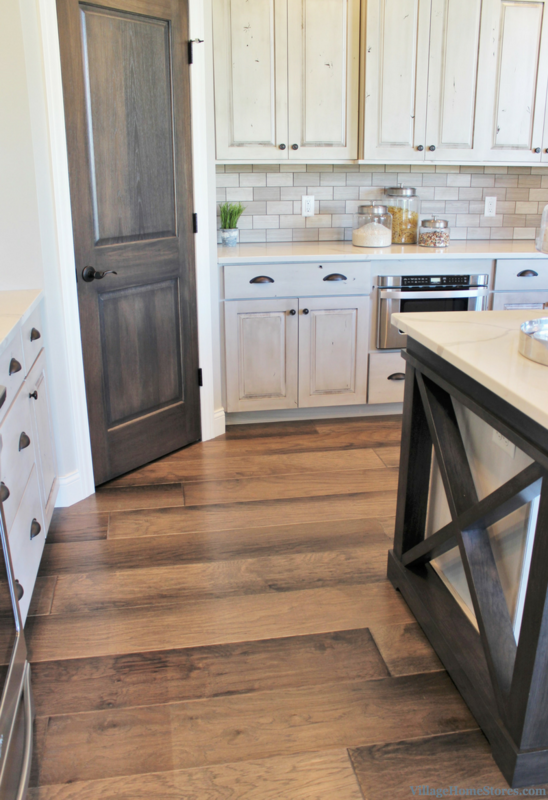 This medium-toned wood floor is a wonderful choice. Of course no farmhouse styled space can be complete without an apron farmsink! 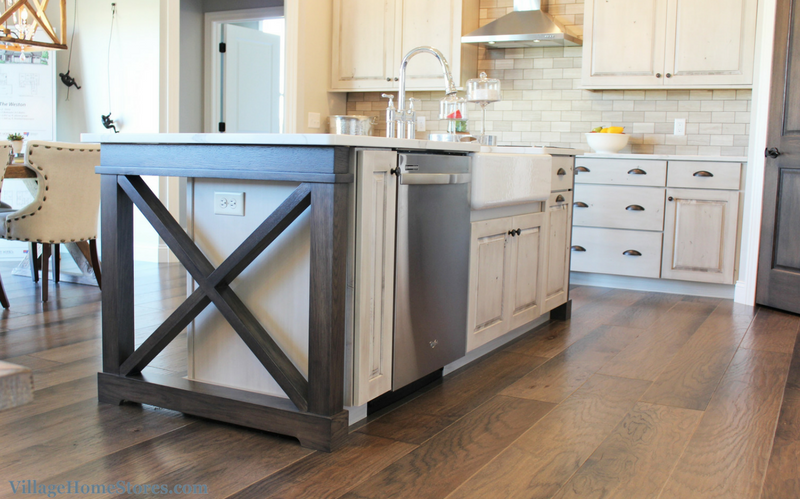 The kitchen island includes a narrow cabinet, the dishwasher, sink base, and pullout trash cabinet. 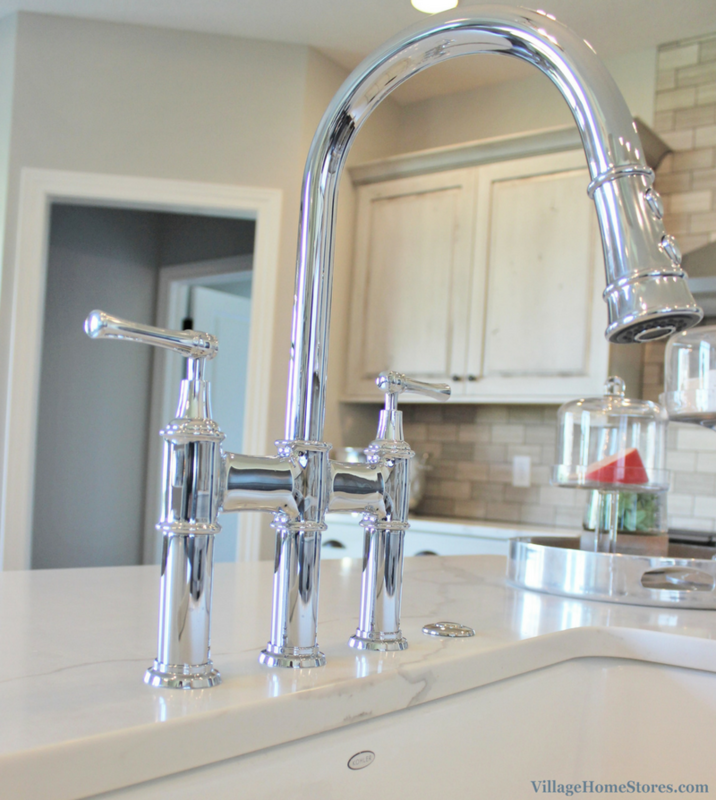 We love the old world style of this kitchen faucet and the polished chrome finish brightens up the room. 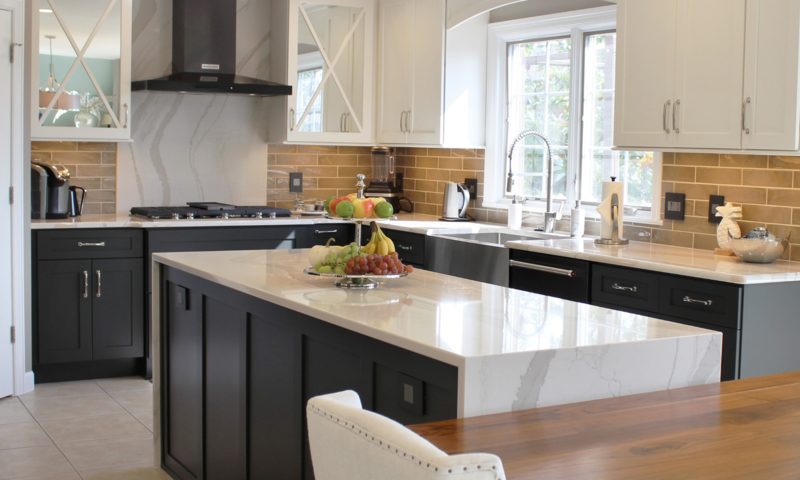 Engineered quartz with a nod to a true marble look can be a wonderful solution for a kitchen countertop investment. 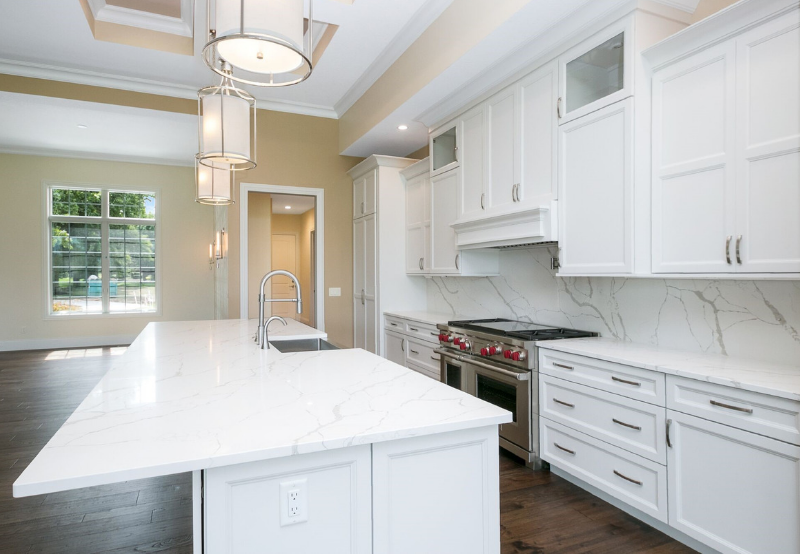 This kitchen uses our Q Quartz line in the “Calacatta Classique” color. 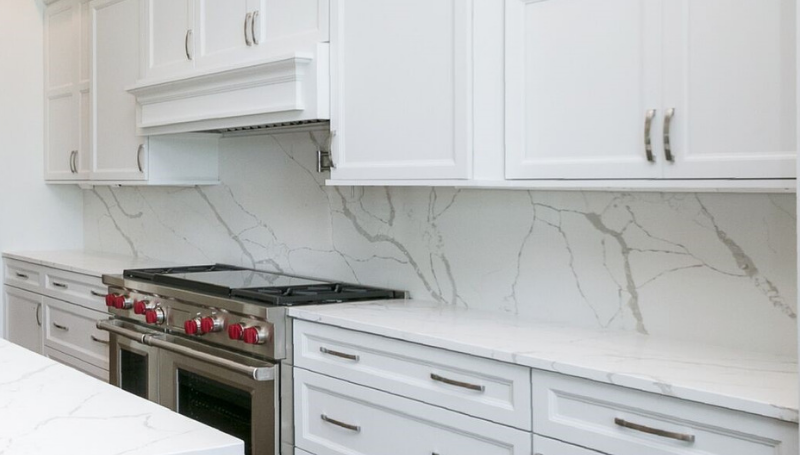 The subtle gray veining is classic and looks right at home here. Once installed, quartz is extremely durable, stain resistant, and maintenance free. The back of the island has been treated with a beaded wood panel. 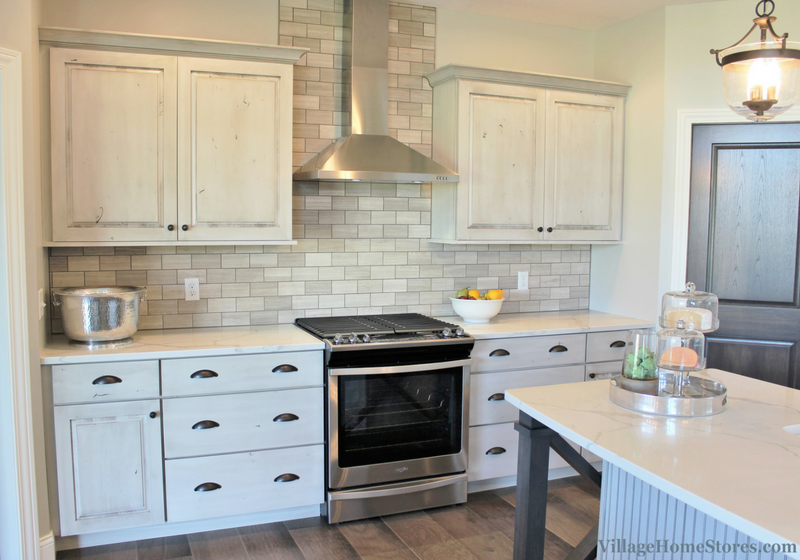 The beadboard look allows the “White Drift” finish highlights to have areas to hang up and show the beaded detail. 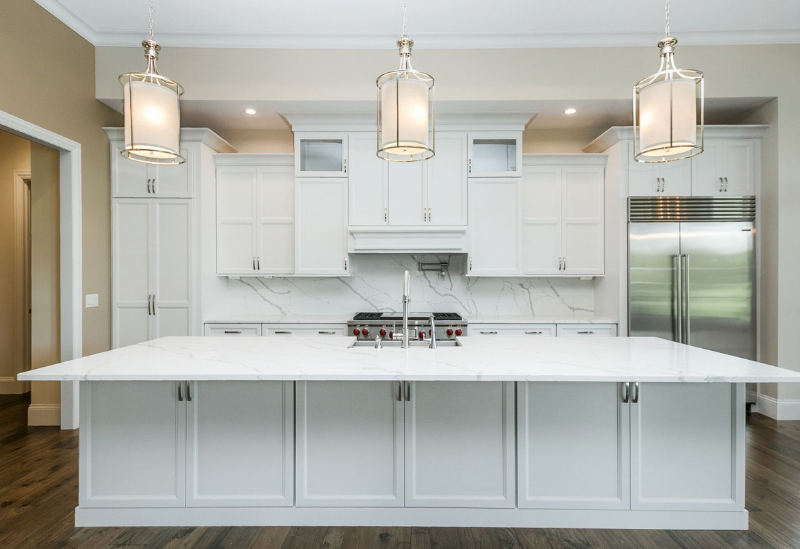 Staggered heights and depths of cabinetry on the perimeter adds interest to the kitchen design. This wall includes the refrigerator and a microwave drawer. The wall on the other side of the pantry is home to the gas range and a chimney style Stainless Steel hood both from our Whirlpool® line. Large stacks of drawers flank the range for plenty of pots and pans storage. This 5-burner gas range from Whirlpool® includes a slide-in style that keeps the area behind it clean and clear for tiled details to shine. All of the controls are found on the front of the unit. 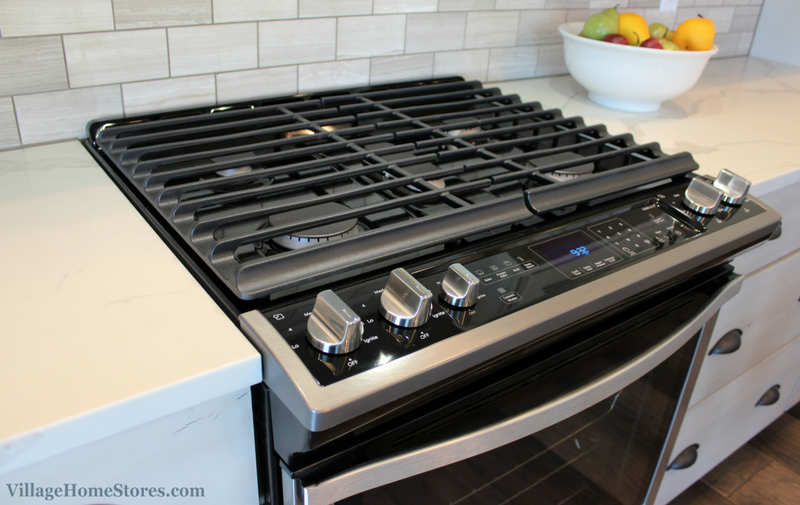 New EZ-2-Lift™ Hinged Grates on the cooktop. An industry first from Whirlpool®, these cast-iron grate hinge open for easy clean up without removing them completely. The oven in this unit also includes True Convection features. A third heating unit in the back of the oven uses a fan to evenly distribute heat over under and all around the 5.8 cu. ft. cavity. 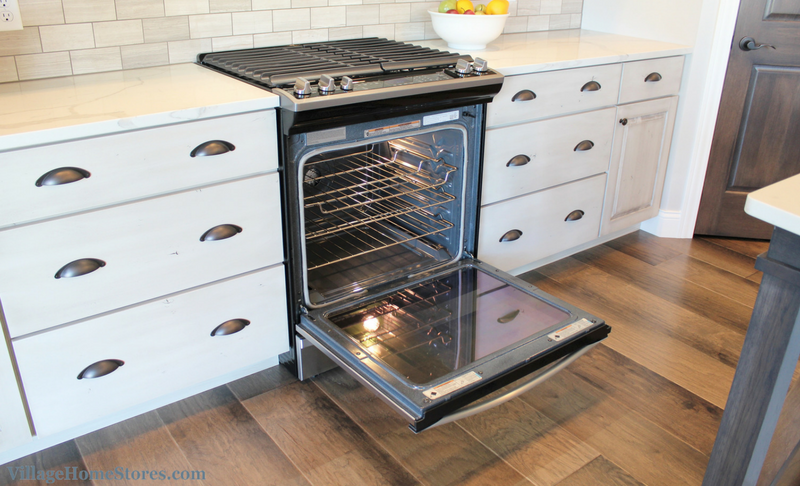 This feature also means 20% faster preheating! Stylish selections that can perform well and clean up fast. 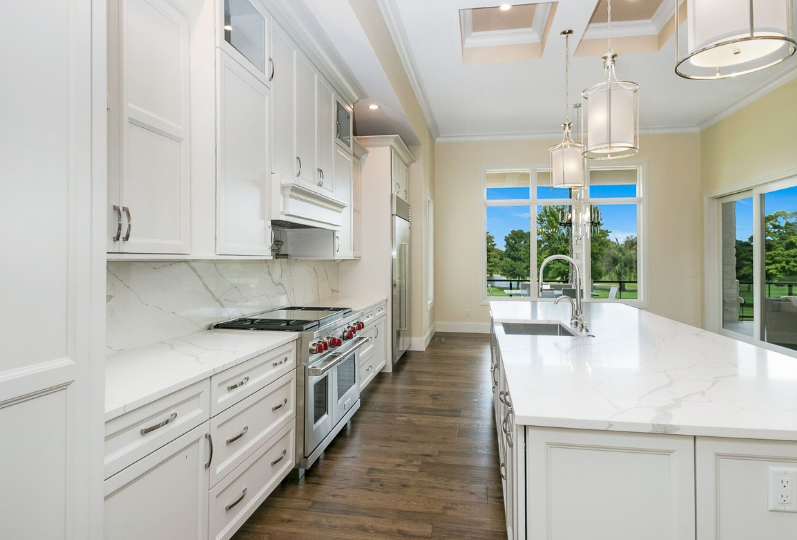 That’s a dream kitchen! The look is beautiful and the features and materials are built to last even for an active family. Plenty of storage in this beautiful kitchen in Bettendorf. Sophisticated rustic details keep this farmhouse style space feeling open, bright, clean, and stunning. The design and selection process can be overwhelming. At Village we work with your builder to help keep you in budget but create a total and complete design. We can see and help show you the “big picture” for your project. 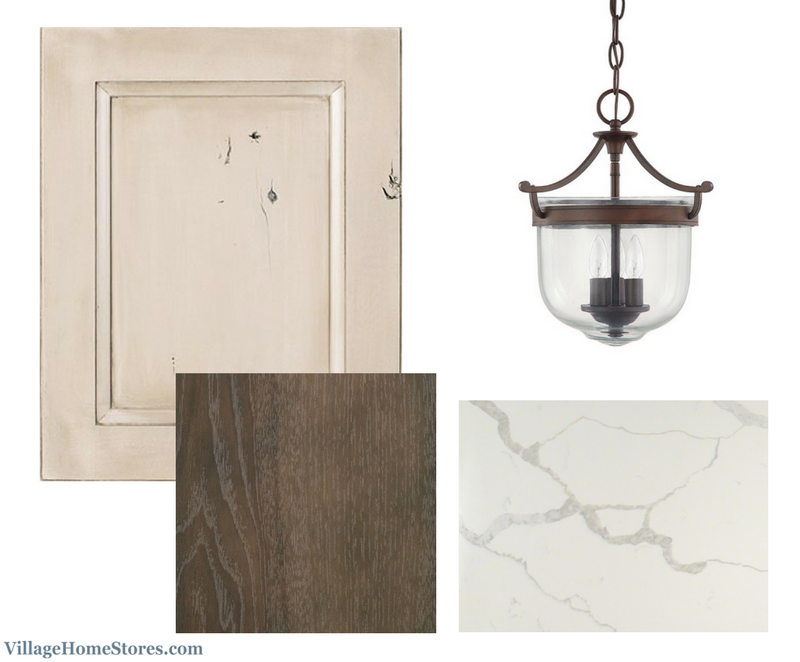 Color renderings and material selection appointments help us keep you on track and give you as clear of a vision as possible for your finished space. 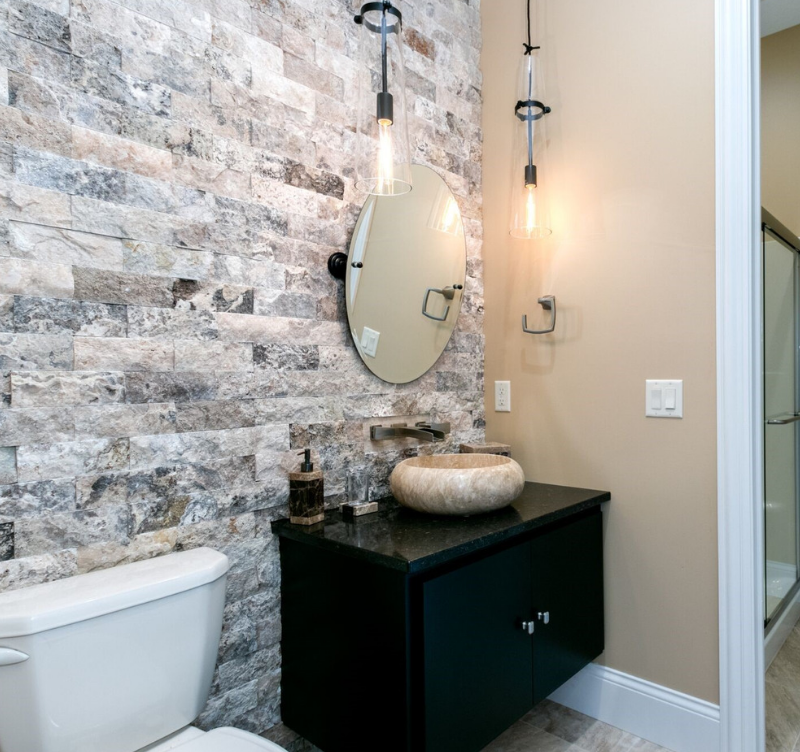 See the full album of photos from this Parade Home here on our award-winning Houzz page. 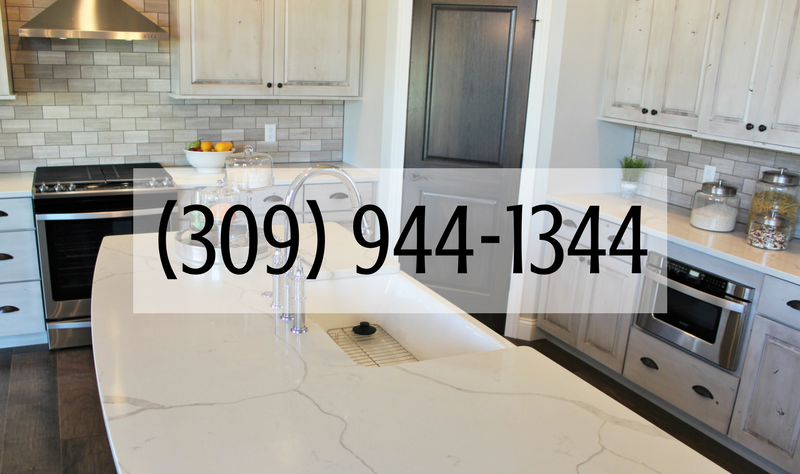 To learn more about Aspen Homes visit their website here. If you have any questions about the building process or want to hear more about our Bundle Lighting Program. exclusive for New Construction customers contact us today! Reach us by completing this short online form or by phone at (309) 944-1344. We can’t wait to hear about your dream home!